My Brother, My Sister, My Country is the eighth anthology and twentieth book published by Poetica Christi Press. It offers the work of 35 poets, 15 of whom are members of The Wordsmith. The others have contributed because of our annual competition. By Jean Sietzema Dickson. 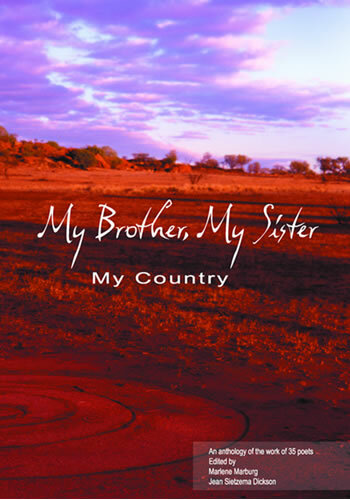 My Brother, My Sister, My Country is an anthology touching some of the most powerful themes in poetry – our land, our lives, our spiritual journeys. Here is a deep concern for injustices experienced now and in the past, and a deep compassion for the land and our relationship with everything this land means to us. The collection is a taste of the rich diversity in this land, and a gateway to explore our own place and our own journeys. Connections between people and place are questioned and explored. These are fresh voices and fresh visions, and a powerful reminder that this place we dwell in dwells in us. By Paul Grover, Editor, Studio. summer reluctant to take its leave. grey tails turned to the coming cold. one last dance before the fall. its rhythmic melody covers the earth. * This poem won the 2004 Poetica Christi Press Poetry Competition.